R.I.P.D. Looks Fun — But Does It Make Me a Bad Fan? It’s based on a miniseries from Dark Horse by Peter Lenkov, Lucas Marangon, and Randy Emberlin that’s over a decade old. (Note that the re-released collection has a much less cartoony cover, to better suit the feel of an action film.) Now, I didn’t care much for the last action movie I saw Ryan Reynolds in, but he looks good in this trailer, and I like Mary-Louise Parker’s deadpan functionary (and she was really good in her last action movie). Plus, the special effects are impressive. 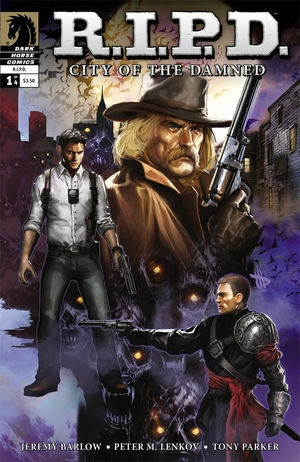 But it got me wondering — Dark Horse has put out a tie-in miniseries, City of the Damned (with different creators), to attempt to capitalize on movie interest, as they should, yet I have no interest whatsoever in reading this in comic form. What interests me is the cast and their interactions. Honestly, when it comes to a four-issue miniseries way back when, I’m not sure the comic provides much to the movie beyond the concept, so I’m not sure it would have any appeal for me. Yet I’m old-school enough that that feels wrong, as though liking the movie without reading the comic makes me less than a “real fan” (loaded as that phrase and these discussions are). Then again, I don’t know anyone who ever read the Men in Black comics, so never mind.